Jaguar’s latest model, the E-PACE touched down in Los Angeles this week ahead of the LA Auto Show, accompanied by renowned British model David Gandy. 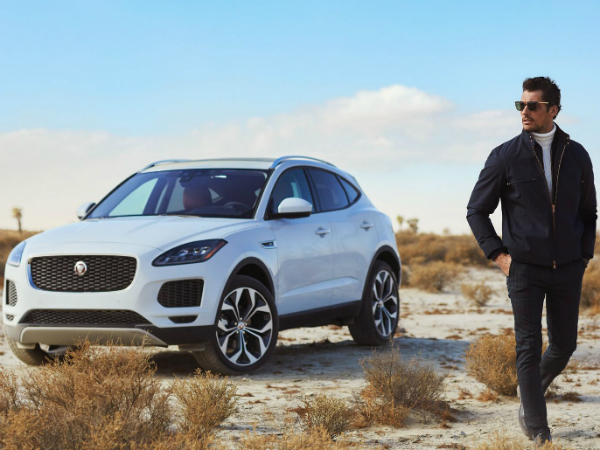 As one of Britain’s most recognisable male models – due in part to his ten year relationship with Italian fashion house Dolce and Gabbana – David was photographed alongside Jaguar’s newest SUV the E-PACE and the iconic E-Type on the Californian lake bed of El Mirage. The shoot was for the cover and editorial piece in a US luxury men’s lifestyle magazine. David is also in LA having recently commissioned Jaguar Classic to locate for him a vintage XK120 sports car. Once identified, the team of experts at Jaguar Land Rover Classic Works in the UK will take the XK120 through the Reborn restoration programme it successfully introduced earlier this year with the original Range Rover, Land Rover Series I and Jaguar E-type. Jaguar Land Rover Classic aims to provide of the very best cars, service and maintenance, original parts and unforgettable experiences for owners of classic Jaguars and Land Rovers. David has been a Jaguar owner for the last ten years and is a true fan of the brand. TOPICS	- Would you like to see Volunteering Opportunities on TeamTalk?